All of our classes prepare the mind and body to sit in meditation for long periods with as few distractions as possible. Many aspects of yoga, i.e. the breath, is central to meditation, and many yogis find that it is a natural place to begin their sitting practice. This class is a systematic method of inducing complete physical, mental and emotional relaxation. During this practice, one appears to be asleep, but the consciousness is functioning at a deeper level of awareness. For this reason, it is often referred to as psychic sleep or deep relaxation with inner awareness. In this threshold state between sleep and wakefulness, contact with the subconscious and unconscious dimensions occurs spontaneously. It offers a space to explore what you need in the moment, as well as an opportunity to work on releasing long-held emotions. In this class, we practice a breath meditation taught by the Buddha called Anapanasati or Mindfulness of Breathing. It is a preparatory practice for Vipassana Meditation as it uses conscious breathing to help concentrate the mind, which is needed in order to develop vipassana or insight. You will find that as you improve in your sitting practice, your asana practice deepens as well as your concentration becomes sharper that you begin to discover the inner dimensions of your life. This self-discovery, practiced with self-acceptance and equanimity, allows you to change destructive habit patterns and therefore your life and relationships. This is the essence of spiritual practice. Also known as Loving-Kindness Meditation, it is a meditation of care, concern, tenderness, loving kindness, friendship–a feeling of warmth for oneself and others. The practice is the softening of the mind and heart, an opening to deeper and deeper levels of the feeling of kindness, of pure love. Loving kindness is without any desire to possess another. It is not a sentimental feeling of goodwill, not an obligation, but comes from a selfless place. It does not depend on relationships, on how the other person feels about us. The process is first one of softening, breaking down barriers that we feel inwardly toward ourselves, and then those that we feel toward others. 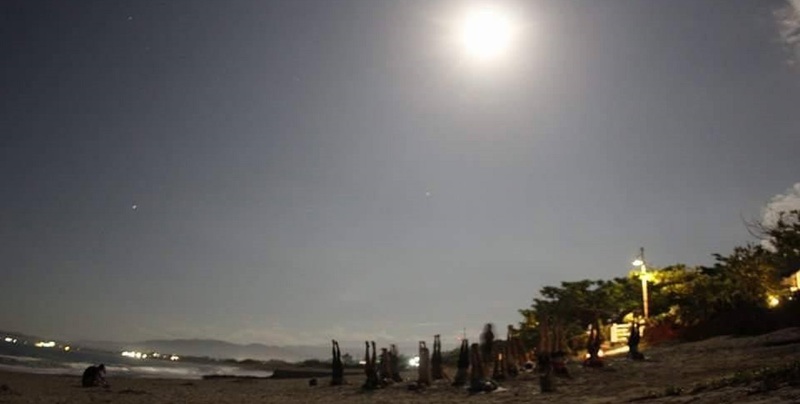 In Aquanimous Yoga, we observe moon days through meditation and ritual to connect ourselves with the functioning of the universe and to make us aware of the effect the universal energy can have on us individually. Being 70% water, we are subject to the moon’s gravitational pull at different times of the month, giving rise to different energetic experiences. Because of these differences in energies it is advised to take rest from our yoga practice. It is also said that practitioners are more likely to injure themselves on moon days therefore it is best to rest. Once a month we observe the full moon and hold a one (1) hour meditation practice. The full moon is a time of heightened energy and of strength and abundance. This is a perfect time for releasing something that no longer serves us; or letting go of something that we no longer need in our lives; or an opportunity to let go of an aspect of ourselves that we have outgrown. A Full Moon meditation and ritual is a powerful way to invoke this. We burn smudge sticks to burn away the old, and we take a dip in the salt water to clean and wash away what no longer serves us. This ritual marks our inner transformation in a formal, ceremonial way. Emphasizing to ourselves and the Universe that we are ready to let go so that the new version of ourselves can emerge, making way for new magical opportunities to come to us. Please bring a towel or blanket to practice on. The New Moon phase is a time of calmness, of introspection. It is the small pause before growth and expansion. This is an optimal time for planning and seeding our intentions. The dark side of the moon, with its mysterious unseen forces, offers a nurturing environment where our intentions can establish roots before their miraculous manifestations begin to sprout and reach out to the stars. Are you ready to attract positivity in your life? With the use of candlelight, incense and essential oils, we meditate and charge our intentions.